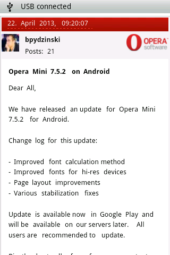 On Monday Opera Software released Opera Mini 7.5.2 for Android. It was mostly a bug fix release but also included font changes. I noticed that the fonts on many sites were smaller in the new release. The new fonts made text on the effected sites hard to read and I immediately went back to the previous 7.5.1 version. 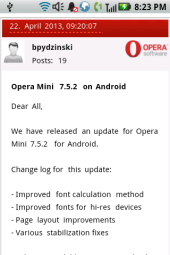 Play Store reviews of the new version were largely negative as were comments on Opera’s own forums. 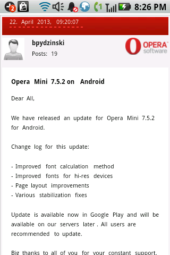 This entry was posted in Browsers and tagged Android, Opera Mini by Dennis Bournique. Bookmark the permalink.